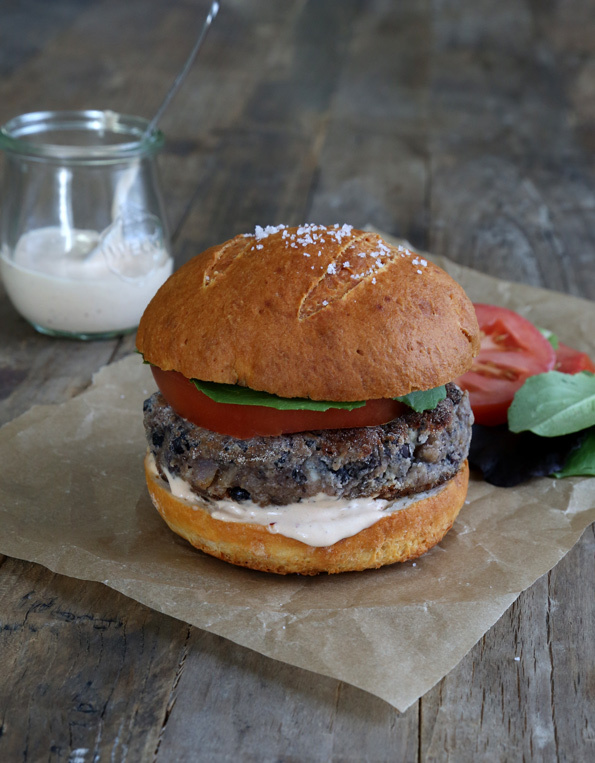 Summer’s best black bean burger is perfect for grilling or cooking on the stovetop. 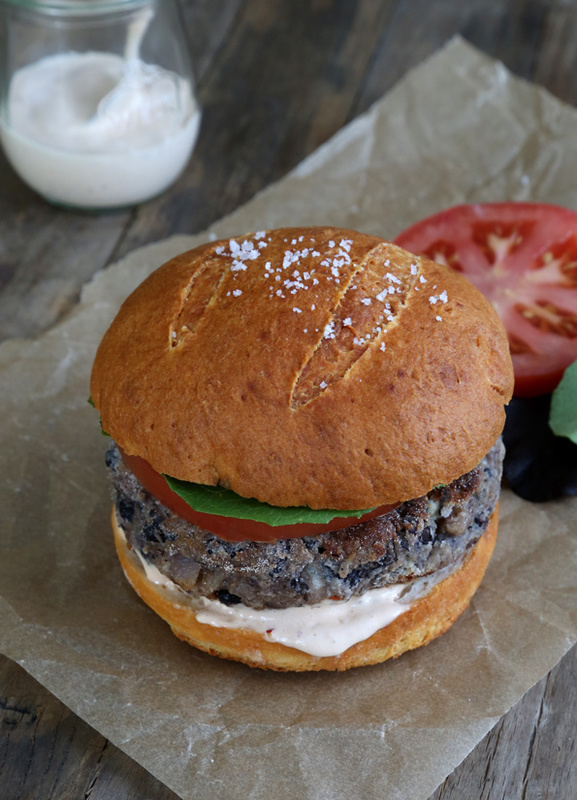 The search for the perfect veggie burger is over! As soon as summer hits, I renew my search for the truly perfect veggie burger. I have come up with recipes for a few in my time (these Quinoa Veggie Burgers are a favorite), but the quest continues summer after summer all the same. I don’t think that a veggie burger should try to taste like meat, since, well, it isn’t meat. Whatever you do, though, you’re gonna need a real gluten free bun. I love these Pretzel Rolls from page 153 of Gluten Free on a Shoestring Bakes Bread here. The smooth texture of the burger with the chew of a pretzel roll is just too perfect for me to deny. But they’d also be great with the Bakes Bread recipe for Gluten Free Hawaiian Buns, reprinted here on the blog. It does take some doing to get the texture of a veggie burger just right, though. It had to be moist but not crumbly, and sturdy enough to stand up to being grilled, if that’s your thing. I like to sauté these burgers in virgin coconut oil in a hot cast iron pan, but they would also do great on the grill. I like to sauté these burgers in virgin coconut oil in a hot cast iron pan, but they would also do great on the grill. They’re sturdy enough to hold up to the grates. Now I know you. You’re going to want to know if these can be made without eggs (I don’t know! maybe try chia seed egg replacements? ), without goat cheese (see my suggestions in the recipe!) 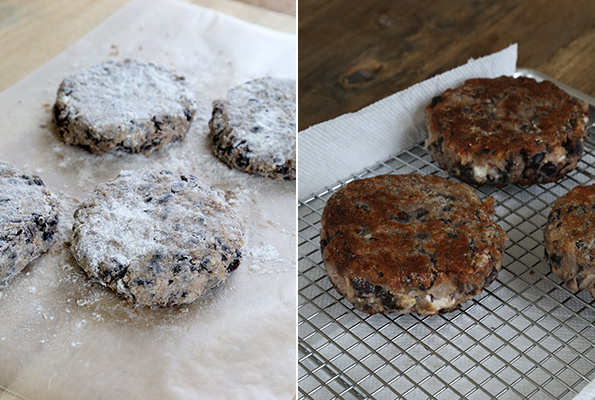 and without black beans (just kidding—they’re black bean burgers, silly). You do need all the elements, though, for the burgers to turn out dense enough but still moist, with the creaminess of the goat cheese, the flavor of the onions, garlic and chipotle sauce. If you just can’t get enough black beans, or just have some left over after this recipe, try my recipe for Flourless Black Bean Brownies. I was so skeptical for so long that you could make delicious brownies using black beans in place of flour, but they are nothing short of amazing—and taste nothing like beans at all! Prepare the pretzel rolls according to the recipe instructions, but divide the dough into 6 larger rolls instead of 8 rolls. In a medium-size, heavy bottom saucepan, heat the olive oil over medium heat and sauté the diced onion, stirring occasionally, until translucent (about 5 minutes). Add the garlic, salt and pepper and cook, stirring occasionally, until the garlic is fragrant (about another 2 minutes). Remove from the heat and set aside to cool briefly. Place the mayonnaise, sour cream and chipotle chili in a blender, and blend until smooth. Set the sauce aside. In a large bowl, place the all purpose flour, xanthan gum, oat flour and whole oats, and whisk to combine well. Create a well in the center of the dry ingredients and add the black beans, goat cheese, eggs, 1/4 cup of the chipotle mayonnaise sauce and the sautéed onions and garlic, mixing to combine after each addition. Cover the bowl and place in the refrigerator for the mixture to chill for at least an hour and up to 2 days. Once the mixture has chilled, form it into 6 patties of about 3/4-inch thick, pressing to pack the patties firmly. Dredge each patty in flour to coat both sides in a thin layer and set aside. Heat 4 tablespoons of coconut oil in a large cast iron (or other heavy-bottom) skillet over medium-high heat until the oil ripples slightly. Place the patties in the skillet to cook until browned on the underside (about 3 minutes), taking care not to crowd the skillet. Flip the patties and continue to cook until browned on the second side (about another 3 minutes). Reduce the heat to medium-low, cover the skillet and continue to cook until the patties feel firm to the touch (about another 4 minutes). Remove the patties from the skillet and place on a wire rack to drain. 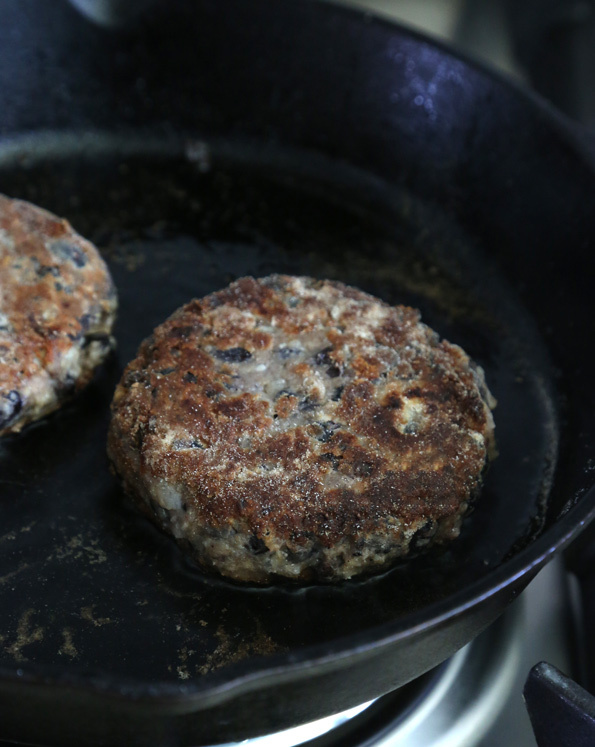 Repeat with the remaining patties, adding more oil as necessary. Assemble the burgers in the rolls with a slice of tomato, lettuce and chipotle sauce. Has anyone tried them on a grill? I searched your page for a veggie burger last week. You always have amazing timing!!! Thanks!! She has a Teddy Web Cam in everyone’s home office, I’m sure! LOL! I always prefer veggie burgers over beef myself. But don’t let the world know! Family business is a cow and calf operation…LOL! My youngest just won’t touch beef burgers or any type of burger… and beans well that word can never be mentioned in this house… that would be just scary! Perfection sister. Just beautiful. just right for summer picnics, BBQs, or whatever. And no. I did not get to the cakesters yet. I did however make GF brownies, rhubarb cheesecake bars, and sour cream coffee cake for festivities this weekend. everyone loved them!